The Sri Lanka Red Cross Society would like to clarify and provide information to the public about the vehicle that was loaned to the Siriliya Saviya Foundation. Sri Lanka Red Cross (then Ceylon Red Cross) was founded in 1936 and was later ratified by the Geneva Convention of 12th August 1949 and the UN resolution 55 (1) recognizing it as a National Society which is Auxiliary to the Government of its established country, in its humanitarian activities. We have the right to act upon our Fundamental Principles of Humanity, Impartiality, Neutrality, Independence, Voluntary Service, Unity and Universality. On the 21st of June 2011 an official communique was raised to our Chairman (President) Mr. Jagath Abeysinghe by the Secretary of the Siriliya Saviya Foundation Ms. Kumari Dissanayake requesting support for transportation for its health related work for women and children. Accordingly on the 22nd of June 2011, our Chairman (President) wrote officially to the Minister of Social Welfare at that time, Former Minister Felix Perera seeking his advice on the next course of action for Sri Lanka Red Cross to take on this matter. On the 27th of June 2011, the Minister of Social Welfare Former Minister Felix Perera wrote back with his consent and concur, while requesting Sri Lanka Red Cross to proceed in providing the said support towards transportation to the Siriliya Saviya Foundation. The Minister also emphasized to Sri Lanka Red Cross that this opportunity to support the Siriliya Saviya Foundation should be considered as a privilege to serve the most vulnerable people of Sri Lanka. Accordingly a defender bearing the number plate WP – KA 0642 was handed over to the Chairperson of the Siriliya Saviya Foundation Former First Lady Mrs. Shiranthi Rajapaksa on the 11th of August 2011. On the 20th January 2015, the Transport Manager of Sri Lanka Red Cross retrieved the said vehicle from the Siriliya Saviya Foundation. We would like to inform the public that Sri Lanka Red Cross Society is unaware of the activities and maintenance of this vehicle from the period of August 2011 to until the time the vehicle was retrieved in this year as it was entrusted to the Siriliya Saviya Foundation. On 30th June 2015, the Criminal Investigation Department (CID) requested our President and our Director General to provide statements on the change of color of the said vehicle, to which both has provided all information known, to the authorities. The vehicle is now in the procession of the Criminal Investigation Department. Sri Lanka Red Cross will continue to provide accurate information to the authorities over the matter in the coming days as well. Rajapakse brothers, the Ministers (better name would be the ‘cronies of Rajapakse), the Army spokesperson, Media people… everyone would jump at any opportunity when they find a tent with UNICEF logo in the LTTE controlled area. They would claim that UNICEF was working with LTTE. Look what we have now! “Health related work for women and children”? Work related to the ‘health’ of Rajapakse children’s rivals, ‘Work’ with women, yeah, yeah.. great stuff. Bloody despots!! They want to do it again?? They know they could take Sinhala Buddhists for a ride with their fake patriotism. “Patriotism is the last refuge of a scoundrel” – Samuel Johnson April 7, 1775. Not only their hands but they bathed in blood. If a regime of their kind had been in office only, they would be free from all the levelled accussions. Come ahead of the months, Rajaakshes will have no respect at all. Question is why is Red Cross donating vehicle to the corrupt President’s wife in first instance?! Red Cross needs to be investigated – a rather dubious organization in Sri Lanka that acts as a middle man, rent seeking and capitalizing on disaster. During Tsunami disaster Red Cross played with Tsunami money just like RADA and Tiran Alles..cheated the Tsunami victims and foreign donors. Red Cross is a pawn or if not a front n the game of terrorists and ministers. You should put the question to former minister Felix Perera. Where did his loyalty lay? Did he pull strings to MR’s orders? Someone at authority should drill down! The Sri Lanka Red Cross is a sleazy and corrupt organization that has been captured by a few cronies who are making money off the funds donated. Thought, of course the youth at the grass roots level are innocent and ignorant of the corruption of the RC bosses. The SLRC is a corrupt organization and the entire board and staff need to be changed and new people with QUALIFICATION and INTEGRITY appointed after the investigation. in black. Is it because the white vans were notoriously famous during the last regime. -Red cross- getting involved in abduction and murders. SLRC lacks good governance. The International Federations of RC is also like that and that is why it partners with sleeze. All these organizations need good governance – but because of silly nationalist attacks they continue while covering up the corruption. So they they changed the color too. Was it the only abduction and murder the the Red Cross Vehicle was used? The Sri Lanka Red Cross import these fancy 4-wheel drive vehicles duty free and with funds granted for humanitarian work. What excuse do they have to use it for the work of another NGO even if it was humanitarian work. Why on earth do they need the military style Defenders. Writing to a Minister at that time and getting a letter of approval from the Minister when it is for the Rajapakse family run NGO is a cop out – just to cover their bums. Why did they not verify that the vehicle was being used for the purposes it was given to this organization – they are obligated to do so since they obtained it duty free with donations. Conveniently, they ignore what was done with the vehicle until after the election. IF the government had not changed then it would not have been brought back. Sri Lanka Red Cross should conduct an independent investigation. It is interesting that during the Rajapakse Regime the NGO-mafia was bandied about as the root of all evil. Now we find both the INGO and the Local NGO to be enablers of their evil. Rajapakse brothers, the Ministers (better name would be the ‘cronies of Rajapakse’), the Army spokesperson, Media people… everyone would jump at any opportunity when they find a tent with UNICEF logo in the LTTE controlled area. They would claim that UNICEF was working with LTTE. A shameless couple – corrupt to the core and brought up three good for nothing, uneducated dumb idiots ! The whole family will suffer for spending public money on European cruises, holidays to exotic locations etc. Is Rocket Rohita investing plundered money through his girl friend / her family ? MY3 and Ranil has not wasted funds for luxirious trips as had been the case with Mahinda Et al. At least that should open the dumb heads of stupid folks. To the manner Bollywood actors go for film shooting roles in the hilly parts of Switezrland, Maharajanao abused the funds for his bombastic gigantic entourages but that brought almost nothing. All pfarts and all loweelevel guys were loaded onto those planes not careing the price hikes of the ordinary man. If all these were their own funds, no matter wasting in that way, but the manner the bugger wasted huge huge sums were as if he has no hearts at all. I’m curious,didn’t the Sri Lanka Red Cross notice that the vehicle was a different color when it came back home? And wow, love the part where they take time off to tell us about the RC’s pedigree, going all the way back to 1936…. now who would think that such an august body would be involved in something as sinister as this? I am excited to note the degree of piousness in Her Excellency’s face and pose. We trusted the RC to conduct itself by its own stated principles of, among others, impartiality, neutrality and independence. These were clearly comprised by providing support to an organisation that enjoyed political involvement. RC had no business loaning assets that would have come from donations encouraged by its founding principles. Perhaps now, donors will start asking questions. before parting with another rupee. Another case of “mata mathaka ne” ? Good key word, why not and why cant lanken authorities check the man´s brain and head injuries today ? And Rajapakshe himself spent peoples funds for Duminda Silva Op carried out in Singapore hospital. To that time, him according to lanken Lawyers to go amnesia and today to react as nothing like that is the case should be a thing to report in British Medical Journal actually. Cant today men investigate the bugger and corner both the alleged and those who proected them in public continued with all blatant lies in tha t regard ? Even if Hiru or other channels are said to be from Duminda, why the rulers to have done adequate is a puzzle to me and the many actually. available in all 3 languages so that potential rogues in future governments will think twice before putting their fingers into the till. The health related work for “women OF THE CHILDREN OF RAJAPASSA”. Then This vehicale is Also gone to A Work WOMEN OF THE CHILDREN OF RAJAPASSA. “We have the right to act upon our Fundamental Principles of Humanity, Impartiality, Neutrality, Independence, Voluntary Service, Unity and Universality”. Sri Lanka’s BORIA AND HIS KILLER FAMILY CLAN Became a Bane to our country bastardizing the law. Will They Attain Nibbana as they Pray and observe HORA sil?????. This is just one of the many allegedly fraudulent transactions/activities of the MR regime. No details of funding/disbursement of the Sriliya Saviya foundation are traceable. This is not the first time that ITI Nonas name was involved in the nefarious ativities of her corrupt husband and sons. Remember the recent Madras Tirupaty OOndiyal scam involving stolen gold ? Greedy buggers. As if the Tsunami loot wasn’t enough. Who is the bugger in the Church receiving and forgiving the confessions of the Most Exalted First Lady? Can an exception me made to take him to the CID for interrogation? Red Cross, skilfully defending your crime involvement as did in May 2009 and prior. The letters have moved in fantastic speed, approval requested and given bla. bla.blah. Her pious look at this Buddhist ceremony is not genuine. Notice how she holds the hands lower compared with MR? Pious Buddhist ladies hold them at that level. This is a fake Buddhist lady and a fake mother. How can a mother condone such devilish acts on the son of another mother? ISIS acts appear to be child’s play in comparison with what they have done. The question also comes up, how many others have been given such treatment. How many young village girls have been used as toys of and made to appear to have committed suicide or disappear in similar ways? Perhaps we are beginning to see only the top of the iceberg! Is there a connection between this and Kotakethana murders? If this story (of the murder) is true and linked to the Rajapakse family, What have these parents taught their three sons?, How do they sleep at night (or do they) ?, What drives them to do such unbearable things? and for what? Do they even pause to think what the Thajudeen family has gone through? We all know MR and the make-up of his brothers but what does Shiranthi as a mother have to say about this? May this Wasim rest in peace and may peace and good sense prevail with his family. 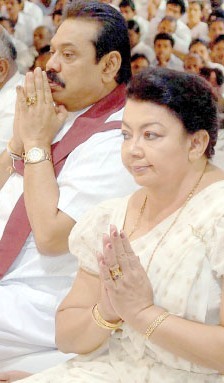 May the nation seek justice from the Rajapakse family. They have blood from the north to the south on their hands. Let them deal with it. However, I have few questions for Red Cross to answer. Can any NGO get the same benevolence / charity from the Red Cross? How many such vehicles has Red Cross given on long-term basis to any other NGO(s)? How could Siriliya Saviya Foundation change the colour of a Red Cross vehicle without their knowledge (as stated in newspapers)? Has this been intimated to the Registrar of Motor Traffic, if the news reports are true? Isn’t the change of colour of a vehicle without informing RMV an offense? If this vehicle has been used for abduction of Thajudeen (as reported in the press), shouldn’t the officials of Red Cross concerned too be charged for complicity to a crime as they are the legal owners of the vehicle used for an abduction? This is a good lesson for Red Cross officials for bending backwards only to curry favour with the high and mighty and deviating from the normal principles and procedure and not acting properly according to their mandate. You know Justicia, when the topleadership is beyond all ethics and morals – what cant go wrong ? Shiranthi is dripping with the LTTE gold that she took into her possession.